Recently our company migrated to phabricator and all went good, BUT for some reason a command to git submodule update --init infrequently gets stuck on our build slaves. Latest phabricator master running on a four core Ubuntu 14.04 server (nginx, php5). Some big Git repos with submodules hosted in diffusion. Jenkins build server with four build slaves. I've also checked that my sshd deamon is working correctly by simply cloning over port 222 (normal sshd port) and everything is working fine. • VitaminCpp added projects: Git, libphutil. • VitaminCpp added a subscriber: • VitaminCpp. git-upload-pack is the server-side part of the git fetch/git pull transfer protocol. 'repo.git' should look like diffusion/CALLSIGN/name.git; Is that right? You can get better information by running the sshd in debug mode - see https://secure.phabricator.com/book/phabricator/article/diffusion_hosting/#troubleshooting-ssh. Other than that, there's not enough information here to help us help you; See https://secure.phabricator.com/book/phabcontrib/article/bug_reports/ for what kind of information we need. Yes, the path to 'repo.git' looks like this: plink.exe git@<our_server> "git-upload-pack '/diffusion/TPTB/3RDPARTY/tbb.git'". I've tried running sshd in debug mode, but the sshd is terminating on every new connection attempt, because it isn't running as a daemon. Maybe a git submodule update --init --recursive doesn't play well with the phabricator SSHD redirection?! Are the submodules all hosted in the same phabricator instance? We have been experiencing the same issue, though we can reliably reproduce on larger repositories with no submodules. The git client preforming the clone remains hung, with the ssh connection open, waiting for the remaining data. When this occurs, the process is in in infinite loop spinning in: https://github.com/phacility/phabricator/blob/master/src/applications/diffusion/ssh/DiffusionGitSSHWorkflow.php#L16 until the client is killed or the process is killed on the server. We can fairly reliably reproduce the issue, and I am more than happy to gather further information. Are there any other details that will be useful in narrowing down this issue? Indeed. It is certainly something we have planned, but other infrastructure projects have taken precedence of late. I will give that a shot. FWIW, I can not reproduce this issue outside of Phabricator. I can't reproduce failures of any kind when cloning directly over the non-phabricator run sshd instance. I will upgrade git now and follow up with my results. I have upgraded git to the latest version. Unfortunately we are still seeing random hangs when cloning. I opened three terminal windows. 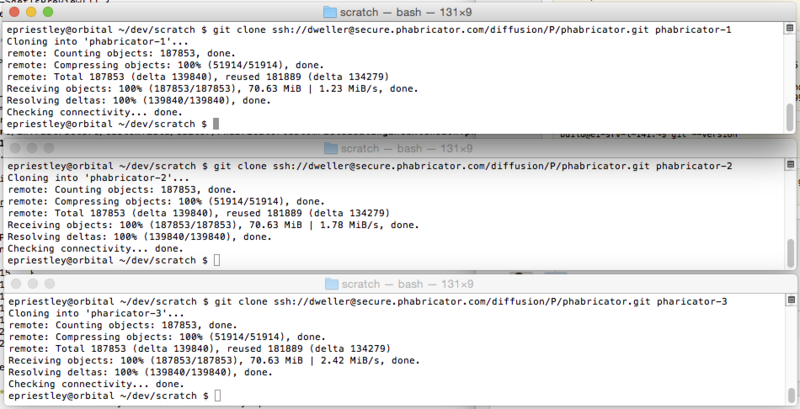 I ran git clone ssh://dweller@secure.phabricator.com/diffusion/P/phabricator.git phabricator-X in each at the same time, where X is one of 1, 2 or 3. All clones completed successfully, and I got three clones in the working directory after they finished. ..but it sounds like older git was also problematic for you. ...hang occurs only if another user concurrently does a git clone. ...it sounds like concurrency of 2 is sufficient to trigger the issue in your environment, so we would expect my test case (with concurrency of 3) to also trigger the issue? Or am I misunderstanding? Does this issue reproduce in your environments under a simple approach like "run git clone in several windows", or only in a more complex case (like "run git submodule update --init in one window, and git clone in a separate window, but only some of the time, also depends on the phase of the moon")? It would be most helpful if you can find a sequence of concurrent commands which are sufficient to reproduce the issue against this server. In our case, I haven't been able to verify that it is an issue with concurrency. We experience this issue without concurrent clones of the repository. However, the issue does not manifest on every clone, but I am able to reliably reproduce within a few minutes of repeatedly cloning the repository. remote: Counting objects: 24923, done. remote: Compressing objects: 100% (14838/14838), done. Usually, within about 5 minutes of this running I can trigger the case. Our repository has no submodules, so in our case, I don't think any submodule actions play into the issue. It always hangs at 99%, but it does not always hang on the same object. We have quite a few repositories hosted on Phabricator, but can only reproduce with a few of our largest repositories (100M+, 35k commits, and a medium sized repository ~40M, 3,500 commits). In an attempt to narrow this down further and verify whether it was an issue with repository size, or number of objects, I ran the same while loop doing a shallow clone of the same repository, which ran for over 12 hours without triggering a hang. Not sure if this will help reproducing on your end, or narrowing down the cause, but I am more than happy to gather more data if necessary. So no submodules were involved. IMHO it must have smth to do with the custom sshd config, because a git clone triggered over the standard ssh daemon is working fine! # NOTE: Edit these to the correct values for your setup. Does this make sense to someone? Again I attached strace to narrow down the problem further. Concurrently lunched 4 clone tasks on my workstation to a single repository. After the 9th concurrent clone attempt it was stuck again. root@server:~# lsof -n -p 53778 | egrep -v "(DIR|REG)"
php     53778  git    5r  FIFO    0,8      0t0 176194 pipe <= STDIN pipe? As you can see it`s definitively no networking related problem. I think the script is waiting forever on some input in ssh-exec.php:269 $metrics_channel->flush();. remote: Counting objects: 3560, done. remote: Compressing objects: 100% (2960/2960), done. As a temporary workaround our company currently uses direct checkout through the standard ssh server until we have a stable phabricator-ssh daemon available. There is a small possibility that D14801 fixed this. That's highly speculative, but it is the kind of low-level bug which could theoretically cause intermittent, difficult-to-reproduce hangs of this nature. Same here... Sadly D14801 doesn't fix this issue. Today I`ve had some more time and investigated this issue a bit further. By narrowing down this further it seems that PhutilSocketChannel->readBytes() doesn't detect an EOF of the "git-upload-pack" STDOUT pipe correctly. I`m no PHP expert, but maybe it has something to do with the issue pointed out here? So IMHO these polling loops don`t detect EOF situations on STDOUT pipes well? I'm fairly confident that D14920 will fix this. I was able to reproduce it with the "run in a loop" method, and narrow it down from there. When you have a chance, can anyone else who was hitting this update libphutil/ to rPHU5afd76 and see if it still reproduces? I'm not aware of any issues with PHP and EOF on reads. I am aware of one issue with EOF on writes (see D7748), but I think this one is just "every comment on php.net is really dumb". @epriestley Thank you very much for this fix and the explanation! It seems that this issue is now finally solved and can be closed. Thanks for the report! Let us know if you run into anything else.